Bruce is located 15 km east of Holden on Highway 14 and is best known for the Bruce Stampede – one of the oldest rodeos in Canada! Bruce is also renowned for the Bruce Hotel which is famous for serving up their sell-out, buffet style dinners – heralded by Alberta media outlets as “Alberta’s Best Barbecue”. The Bruce Community Centre is available to rent and is an ideal spot for family reunions and weddings, with lots of parking for RV’s. A nice, quiet, safe country atmosphere with playground, horseshoe pits, and a ball diamond. For information call 780-688-3510. Kinsella Bring your dauber and lucky charm to the weekly satellite bingo held every Tuesday at 7 pm. Get your tickets early to the three performances staged each year by the Performing Arts Guild. They include a delicious home cooked meal. Plan to attend Kinsella’s popular Bullarama in July. 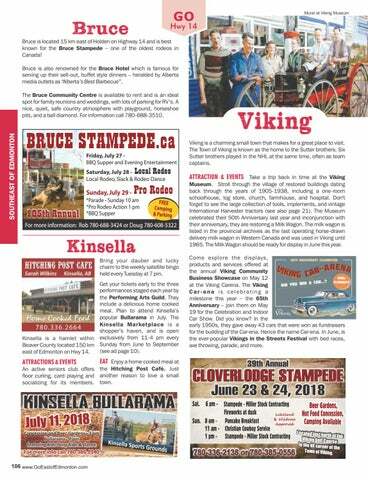 The Kinsella Marketplace is a shopper’s haven, and is open Kinsella is a hamlet within exclusively from 11-4 pm every Beaver County located 150 km Sunday from June to September (see ad page 10). east of Edmonton on Hwy 14. 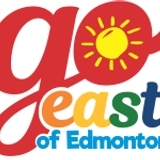 EAT Enjoy a home cooked meal at ATTRACTIONS & EVENTS An active seniors club offers the Hitching Post Café. Just floor curling, card playing and another reason to love a small socializing for its members. town. Viking Viking is a charming small town that makes for a great place to visit. The Town of Viking is known as the home to the Sutter brothers. Six Sutter brothers played in the NHL at the same time, often as team captains. ATTRACTION & EVENTS Take a trip back in time at the Viking Museum. Stroll through the village of restored buildings dating back through the years of 1905-1938, including a one-room schoolhouse, log store, church, farmhouse, and hospital. Don't forget to see the large collection of tools, implements, and vintage International Harvester tractors (see also page 21). The Museum celebrated their 50th Anniversary last year and inconjunction with their anniversary, they are restoring a Milk Wagon. The milk wagon is listed in the provincial archives as the last operating horse-drawn delivery milk wagon in Western Canada and was used in Viking until 1965. The Milk Wagon should be ready for display in June this year. Come explore the displays, products and services offered at the annual Viking Community Business Showcase on May 12 at the Viking Carena. The Viking Car-ena is celebrating a milestone this year – the 65th Anniversary – join them on May 19 for the Celebration and Indoor Car Show. Did you know? In the early 1950s, they gave away 43 cars that were won as fundraisers for the building of the Car-ena. Hence the name Car-ena. In June, is the ever-popular Vikings in the Streets Festival with bed races, axe throwing, parade, and more. Course in the NE corner of the Town of Viking.